There is a noticeable increase in the number of women joining the police training academy as Kuwaiti women are constantly encouraged to participate in all areas of society, according to women Lieutenants at the Support Authority Institute of the Saad Al-Abdullah Academy for Security Sciences. Historically, only men were allowed to participate in the police force since the establishment of the State of Kuwait. 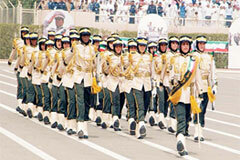 The first batch of female cadets in Kuwait graduated in March 25, 2009 in an elaborate ceremony attended by His Highness the Amir and Supreme Commander of the Armed Forces, among other senior statesmen. Last year the country has witnessed a landmark parliamentary election as well where four women competed fiercely with their male counterparts and were enthusiastically elected by their districts. Saudi Arabia is planning to bring in a new law to allow women lawyers to argue cases in court for the first time. Justice Minister Mohammed al-Eissa said the law was part of King Abdullah’s plan to develop the legal system. The law - to be issued “in the coming days” - would allow women to appear in court on family-related cases, including divorce and child custody. At the moment, they can only work behind the scenes in government and court offices. 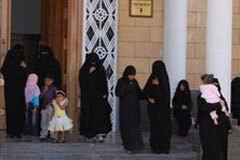 The new legislation will also allow Saudi women to complete certain procedures without the presence of a witness. “In accordance with the new law, women will be able to complete their preliminary procedures with notaries by just presenting their IDs,” said Ministry of Justice official Osama al-Mirdas, according to Arab News. Abu Dhabi - Times change. And ideas, customs and beliefs do change accordingly. A few years ago, no one would believe that a woman from the conservative society of the UAE would go to watch a football match, let alone play it. Yet the UAE women’s national football team is now taking part in the West Asian Zone Championship that it is hosting. Teams from Jordan, Palestine, Bahrain, Iran and Kuwait are participating. The transformation from merely allowing women to watch football matches to actually play did not happen easily. It was the outcome of dedication by the pioneers and an enlightened generation of educated men and women. Hafsa Al Ulama, Chairwoman of the Women’s Football Committee at the Abu Dhabi Sports Council, was one of the first to fight for the UAE women’s right to practise sports in general and football in particular. More than three million Iraqi men have been killed in the Iraq War since 2003, leaving behind nearly 740,000 widows and an inestimable number of children. When suddenly left without a husband, newly widowed women have few resources and very little idea of what to do next. The same social customs that kept many of them from being educated as young women now prevent them from working as adults, despite the fact that many are in acute economic need. IWO helps widowed women form a cohesive voice and provides aid to needy women wherever possible, assisting them to become economically independent. As a result, many widows have gained an education, and have been given a voice. Through microloans, they became businesswomen, and many now can support themselves and their children. Kabul - A delegation from several Italian universities and aid foundations visited Herat recently to launch two education development projects. The first project aims to improve the quality of the educational system for Afghan women through training of educators and the delivery of 50 full scholarships for women to attend the Research and Development Institute of Kabul. The second is a collaboration between the University of Herat and the Research and Development Institute of Kabul to establish a university course called “Solidarity and Human Development” aimed at improving perceptions on the value of women and their role in rebuilding Afghanistan. In what appeared to be the first burst of activism in months not related to the disputed presidential election, about 1,200 Iranians signed a statement against a bill that would further curb women’s rights, the feminist Web site Change for Gender Equality reported. The statement, issued Wednesday, calls for other groups to protest the bill, which would give men the right to take additional wives without having to tell the current wives under certain conditions and would impose restrictions on alimony for women. Women have played a major role in the protests since the election in June, which the opposition claims the government of President Mahmoud Ahmadinejad stole. Many women have been jailed and at least several were killed in the government crackdown on street protests that followed the vote. Women’s rights in Iran have been curtailed since the Islamic Revolution in 1979, but in recent years, women have been displaying an increasing determination to achieve equal status in this conservative Muslim theocracy.